Today, a post with lots of pictures to show some progress. Above is winter density lettuce and giant noble spinach that was direct seeded in late September last year. Its been slow growing. The light in the greenhouse is not ideal. At some point in the future we may change the design a bit and paint to help scatter the light and reduce the shady spots. These are our shallow beds (6 inches deep) with swiss chard, lettuces, arugula and spinach growing. We direct sowed these beds about 2 weeks ago. Temperatures in the greenhouse have ranged from 37-100 degrees in that time. Sometimes that range has occurred in the same day! Not a great picture, but you can see how big the tomato plants are already. I took this picture in the heat of the day before we remembered to vent the greenhouse. I'll be planting some more tomatoes out in the next couple days, just waiting on road restrictions to lift so that we can get our topsoil delivered. We didn't luck out for a free source of that, but we did find some excellent topsoil at a reasonable price. More beds in the greenhouse with arugula and lettuces. We started these indoors at the same time as the tomatoes but planted them out in the greenhouse 3-4 weeks ago. We've been harvesting the arugula recently. We used it in a pasta dish and also made flank steak pinwheels that tasted great. Its nice to have a source for this now as we can't get arugula in our town. Above is a tomato flower inside our solarium. We have another brandywine tomato flowering in a bed in the greenhouse. All other tomato plants have buds that have not yet opened. Can't recall if this is a lemon or lime tree! I didn't mark the pots because I thought that there would be no way I would mix up the trees. This tree has lost a lot of leaves but is putting out some new growth. To leave the fruits or prune them back? Hmm.. I think I know the right answer but pruning seems too harsh. Our antohi peppers are starting to flower. The Jalapenos, cayennes and bell peppers are not far behind. 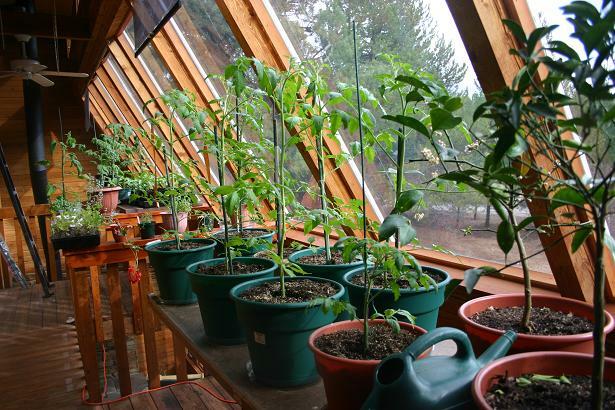 Some will be staying in gallon pots in the solarium while others are planted out into the greenhouse as soon as the topsoil arrives. A view of the solarium. Things have sure filled up with our booming tomato crop. Next year I think I will grow about half of the tomatoes indoors that I started this year. The real pain is watering all of these potted plants! It takes at least half an hour to do that and it needs to be done about every 2-3 days. I think next year it might make more sense to start 5-10 plants in early January for keeping in pots in the solarium. Then around the middle of February, it might be a good time to start plants that would then go to the greenhouse to live. Finally, around the middle of April plants that would go live outside could be started as that is 6 weeks before our last frost. Right now everything is a big experiment. I have yet to find a great gardening book that really addresses our exact needs. Sure there are books that talk about constructing cloches, and cold frames, but an unheated solarium in a double envelope house that is south facing at a northern latitude is another beast altogether! Lastly, a fun picture. It's not all work at our house! While I was cleaning up the yard my husband made me the rope swing that we've been talking about all winter. It's perfect! You guys are going to have some early crops this year, experimenting sure is fun and often quite rewarding. Here is a book you might find interesting if you are so inclined. Also, I found this article to be interesting. Unfortunately we do not have enough sun for a solar greenhouse in the winter...too many trees in the way.